Too often when we think of office decor we think of blah manila folders and heavy duty furniture. Not anymore! These home office organization solutions will reinvent your storage woes and give your organization a stylish upgrade. When it comes to home offices you don’t want to sacrifice style for function, and fortunately, you don’t have to. Coordinating storage, strategic color, and wall space you can create a home office that is as good – maybe even better – than the real deal. 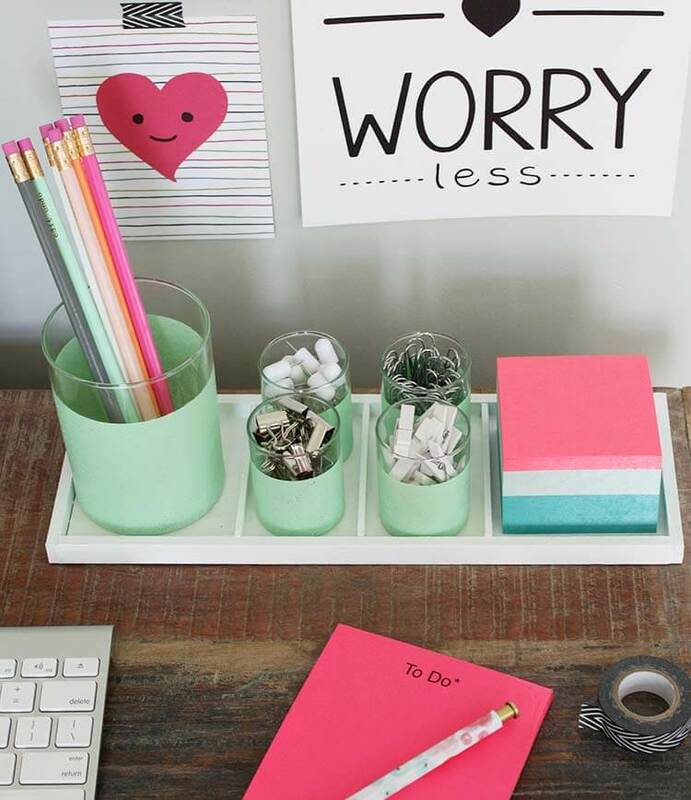 Making the most of your home office storage will also help keep your workspace and your living space well-defined. Instead of having files and materials everywhere, all the important things you need to do your work will be organized and put away in your workspace, making it easier to get work done so you can go play. 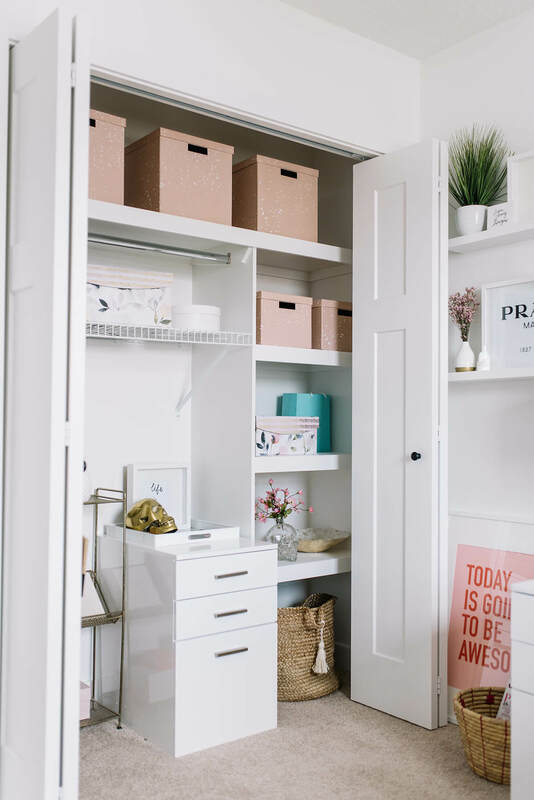 Just define your style and decide where your home office will go, then use these 14 ideas to inspire the most stylish storage and organization your house has ever seen. If you think file storage is ugly and boring, think again. 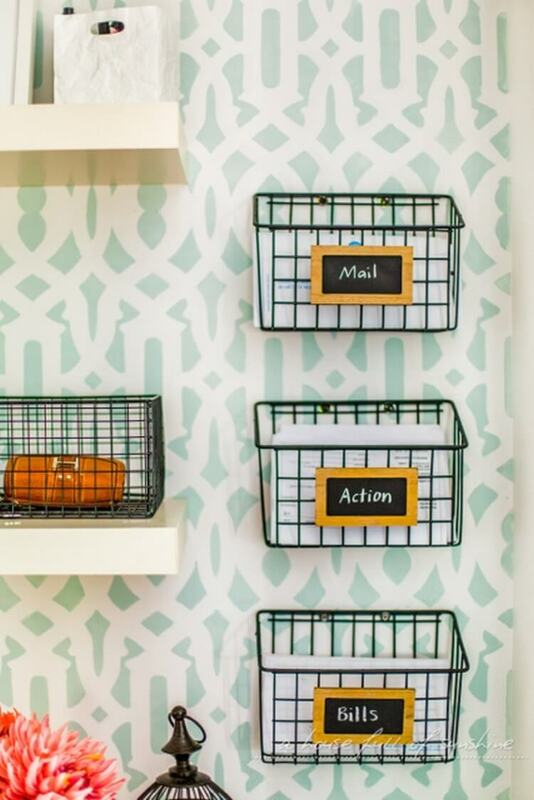 These adorable wire baskets are made even cuter with little chalk labels to keep you organized. Hanging them on the wall next to the floating shelves saves floor and desk space, and adds to the home office design. 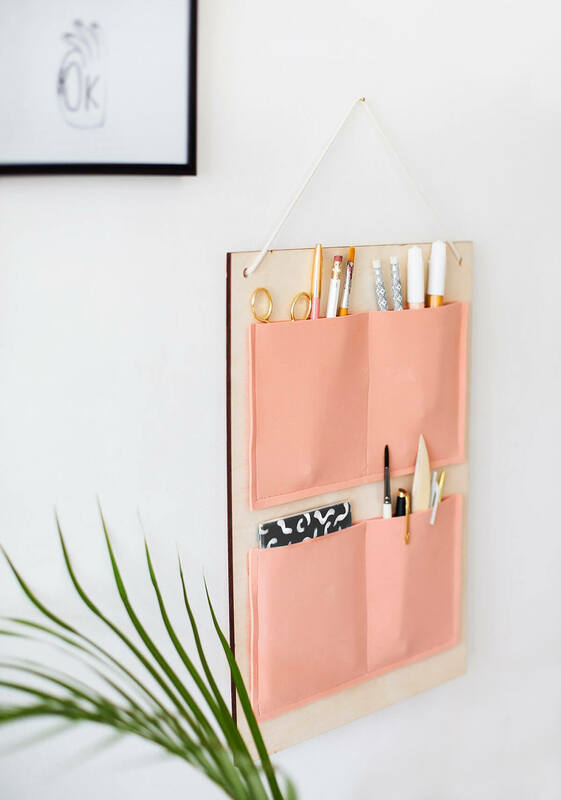 It’s a great way to keep organized and stylish at the same time. This command center is like a home office for the whole family. You can set this up in a high traffic area like the kitchen to keep everybody on schedule and on the same page. When your family gets in the habit of keeping track of everything in the command center you’ll be amazed how much time and hassle it saves. Because, really, who has time to sit down at a desk! Let’s do a little home office math. Dresser drawers plus shelving unit equals space-saving home office organization. With a simple bracket to secure the shelves on top of the dresser drawers, you can create a vertical wall unit in a snap. Want a home office but don’t have any real estate to give up in your home? Enter the secret home office closet solution. Open the doors for business hours and all your files and supplies are neatly organized on shelves and in drawers. When you’re done, close the closet doors and no one will be the wiser! 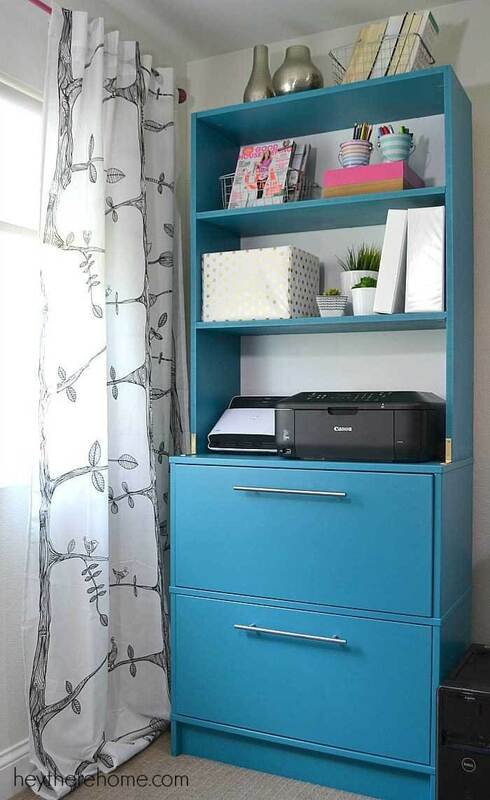 This is an awesome idea for a home office in a guest room or in a studio apartment. You can mix and match patterns and shapes to give your desktop storage a little personality. A simple clear acetate cube for pencils looks positively chic next to a gold and cream banded note holder and a vase of fresh flowers. 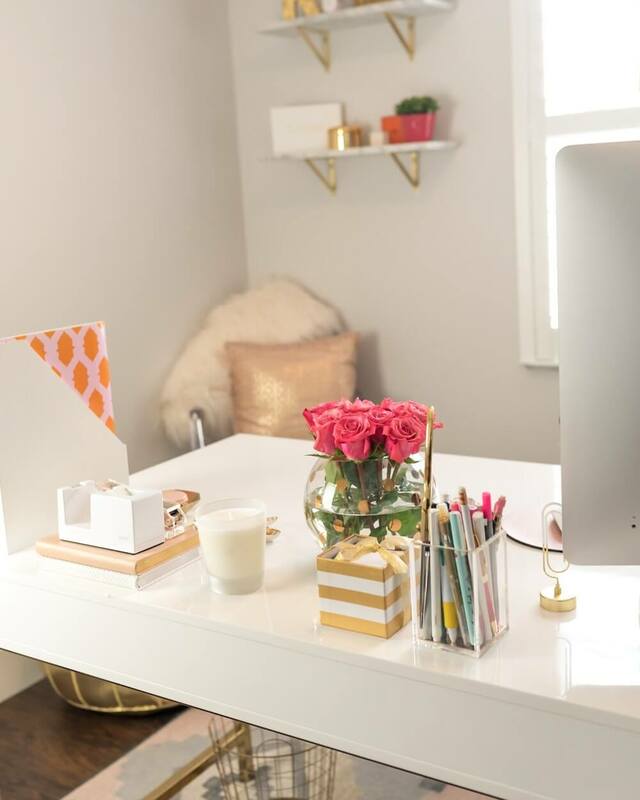 Being organized is the most stylish home office idea of them all, so do it with aplomb! The art of home office storage is sorting clutter and looking good while you’re doing it. Take this wall hanging, for example. A simple board with peach fabric pockets puts all your essentials within reach and blends right in with the framed artwork on the wall. Shuffle around your desk drawers no more! 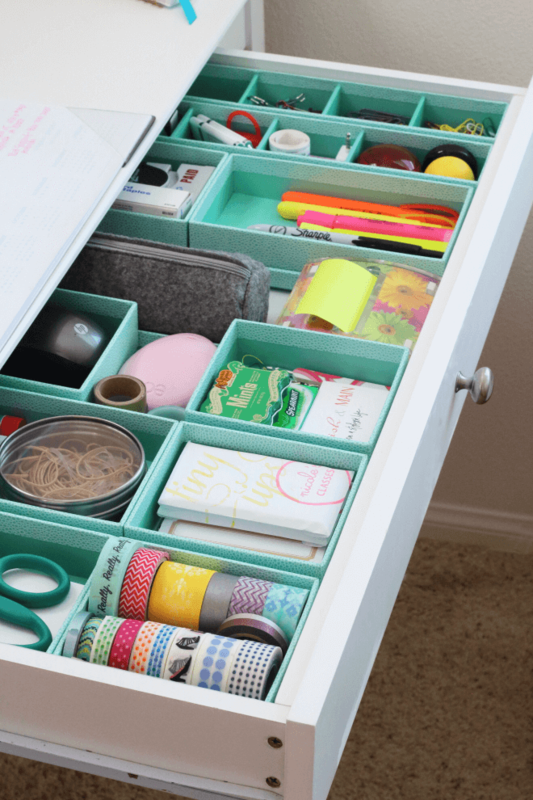 Use dividers in your drawer to keep things perfectly organized. This is super simple to do with gift boxes. Just make sure they’re a little lower than the height of your drawer. Using colored boxes like this turquoise adds a nice touch. Choose boxes in multiple sizes so you can accommodate different shaped items. Have you ever had an, “out of sight, out of mind,” moment with a file that you stored away deep in a filing cabinet? 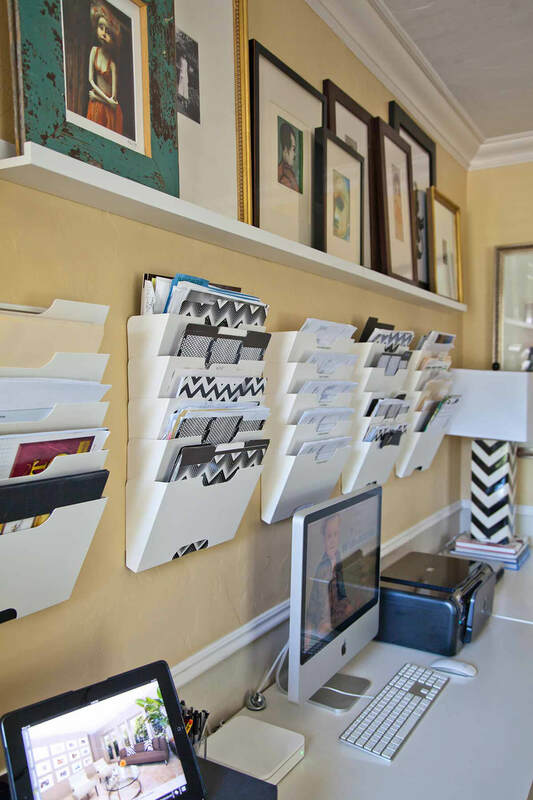 Bring those files out into the light with a wall-mounted filing system. It’ll free up the space that you’d use for a filing cabinet and put all your files conveniently at eye level above your desk. Use a consistent color scheme to keep it attractive. No filing cabinet? No problem! 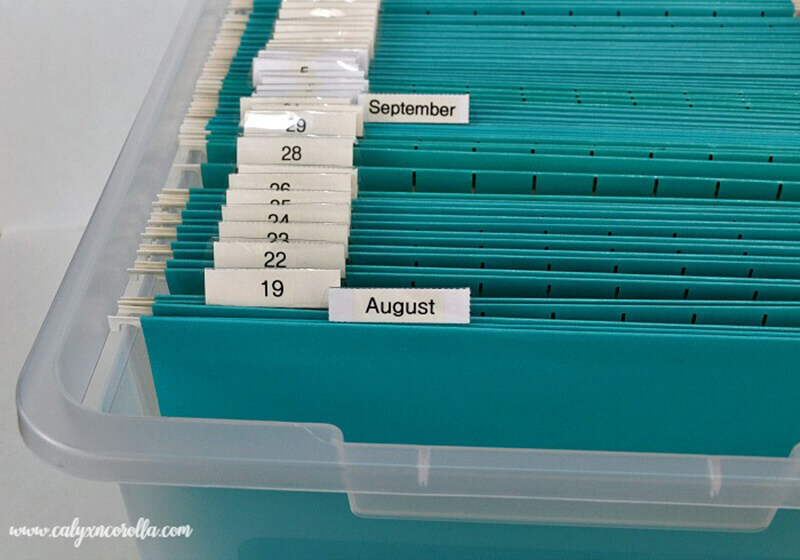 You can have a fantasying filing system with just some hanging folders and a plastic tub. Use plastic tabs to label your system so you can easily find what you’re looking for. Filing cabinets can be heavy and unattractive. Using this system, you’ll have ready access to your files, you can move them if you need to, and you can store them away discreetly. Sometimes you just need to be able to see where everything is. 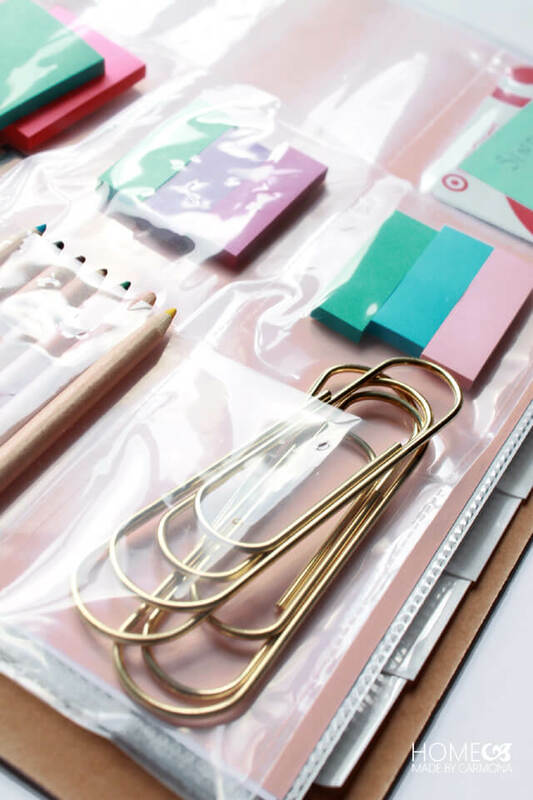 Storing the little things like sticky tabs, paper clips, and pencils in clear pouches makes it easy to find what you’re looking for at a glance. Just group like items together and you’ll find what you need in no time at all. 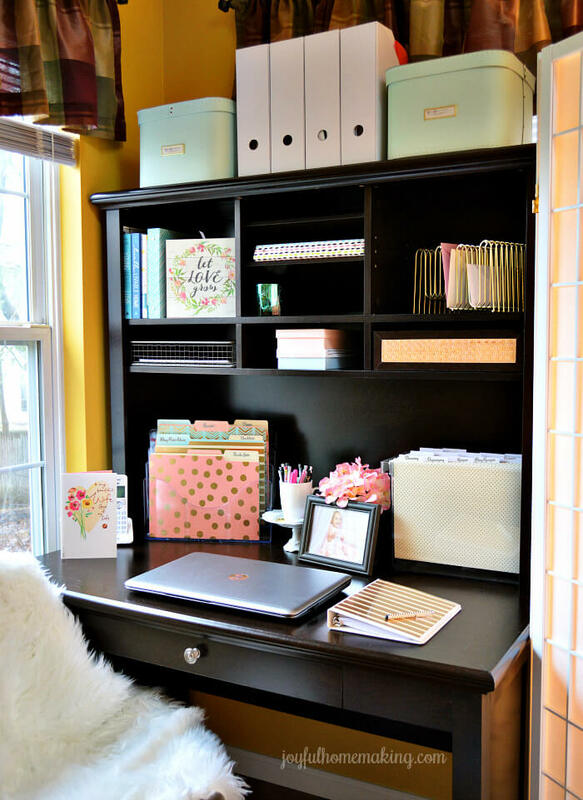 There’s a place for everything and everything is in its place with this nested home office organization idea. The corner desk maximizes space while the cubbies and side table tucked under the desk provide storage for files and equipment. Keeping it all monochromatic in white gives a fresh look and minimizes the appearance of the office furniture so it doesn’t take away from the rest of your home. Even if you are short on space, you can still have a home office! Just think up instead of out. 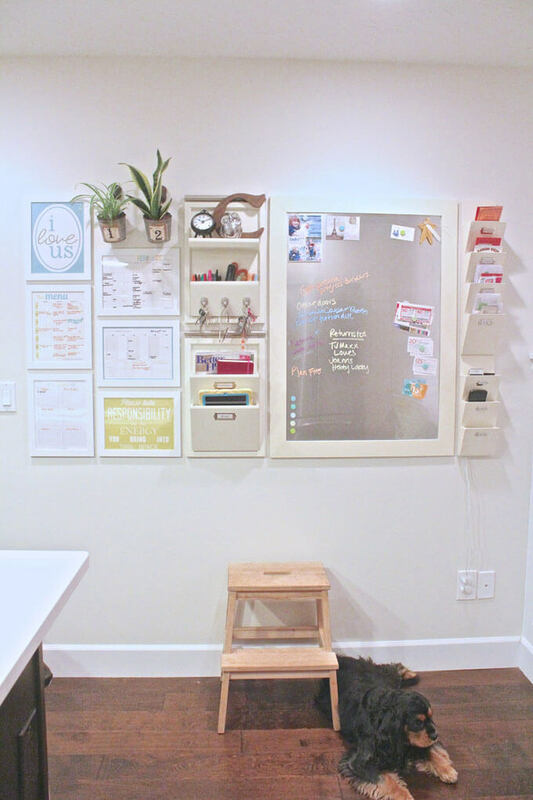 This vertical desk is only the width of a hutch, but the cubbies and backboard add much-needed shelving and storage. This is an especially simple solution if you have a laptop and don’t need much surface area for a desk. Sometimes too many storage containers for your odds and ends can start to look messy. This nifty tray is the perfect solution. By keeping the storage containers in the same design scheme (glass with seafoam green wrap) and neatly organized in the tray, everything looks pulled together. Is there anything that mason jars can’t do? 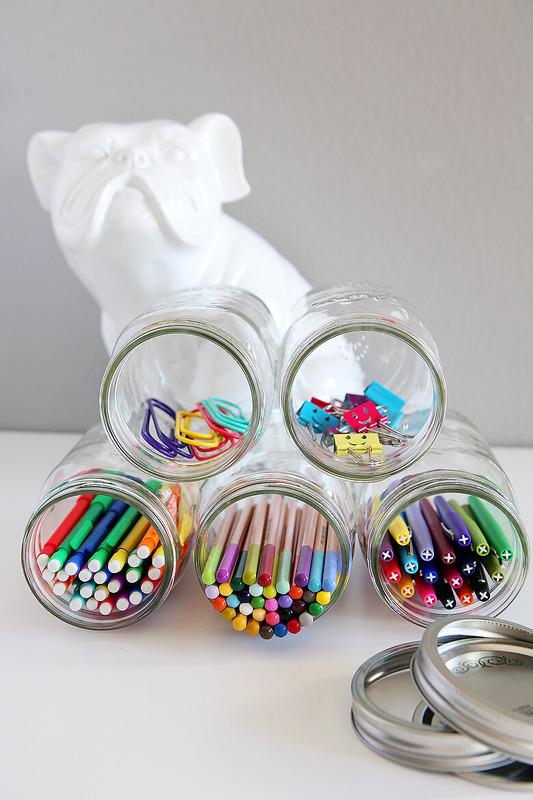 From the kitchen to the craft nook, these multitasking glass jars are here to save the day! They add that signature brand of farmhouse chic to the mix while neatly organizing your office supplies like pencils, pens and paper clips where you can easily see them.